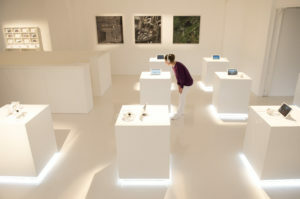 London, UK – 24th October 2017: At noon on Wednesday, the doors to The Glass Room, London’s latest sleek pop-up store, will open, offering curious visitors a glimpse into the implications of our increasingly digital lifestyles. 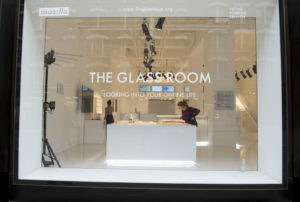 The Glass Room, produced by Mozilla and curated by Tactical Tech, highlights the flipside of life in the digital age through an animated, creative space that combines artworks, interactive workshops, videos and guest speakers to visualise our data and explore how it is freely harvested, traded and sold on a daily basis. Running from 25th October to 12th November in London, The Glass Room aims to help people identify and reduce their digital footprints, having helped more than 10,000 New Yorkers do the same in 2016. We Know You: The Big Five (Amazon, Google, Facebook, Apple, Microsoft) are no longer the disruptive upstarts of their “Don’t Be Evil” origin stories and are today fully enmeshed in our daily lives. They are also the biggest companies in the world, with the power to influence everything, from the next hot consumer trend to shaping the global political stage, with the tweak of an algorithm. Pieces created by Tactical Tech and La Loma visualise this data and explore how much we know about these companies who know so much about us. Something to Hide: We often hear the argument, “I have nothing to hide” but are we aware of how much we aren’t hiding in return for free or convenient services? These pieces explore the unbalanced and often invisible data exchange in a playful way and offers food for thought on how such data could be used and abused. Big Mother: In this age of “Big Brother”, surveillance comes in many forms, with the State introducing a new brand of “care-veillance”. A new program designed to provide swifter access to in-home monitoring of elderly relatives is being welcomed as a safety net to allow safer independent living. But who holds that data and how is it protected? This installation investigates the risks and rewards of this new breed of surveillance society and explores if and how we can opt out. Open the Box: Take a peek beneath the screen to the data patterns and traces we leave in our wake. This section visualises the data footprints that we leave behind for all to see, and examines how this data can be collected, analysed and used by others. A series of guest speakers throughout the duration of the pop-up will host lectures, workshops and interactive sessions on many key issues raised by the proliferation of data and the exponential growth of our online lifestyles. Confirmed speakers include artists Adam Harvey and !Mediengruppe Bitnik, journalists Eliot Higgins and Carl Miller, and many others. 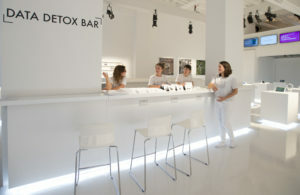 For those who wish to explore further, “Ingeniuses” at the Data Detox Bar will show you what the data brokers see, allow you to manipulate the online advertising that others see and even create fake news on real news websites – encouraging us all to think twice before taking anything online at face value. For those who wish to learn how to reduce their digital footprint and make more informed choices about their online activity moving forward, the Ingeniuses will be able to provide practical tips and everyone can try the ‘8-day Data Detox kit’, available from the event or online. The Glass Room will be open to the public, free of charge, between 12pm and 8pm daily from Wednesday 25th October to Sunday 12th November 2017. At the same time as The Glass Room, MozFest, Mozilla’s week-long festival (23 October to 29 October) in London opens, focusing on Internet health issues like online privacy, web literacy, and misinformation. Mozilla Mozilla is the not-for-profit behind the popular web browser, Firefox. We believe the Internet is a global public resource, open and accessible to all. We work to ensure it stays open by building products, technologies and programs that put people in control of their online lives, and contribute to a healthier Internet. Tactical Tech is a Berlin-based organisation working at the intersection of technology, human rights and civil liberties. They provide trainings, conduct research, and create cultural interventions that contribute to the wider socio-political debate around digital security, privacy and the ethics of data.